I'm aware of how ridiculous it sounds. Bare in mind this wasn't a calm or reasonable situation, the guy was kicking off throwing punches, he'd taken his chain lock out and was flinging that round, hit one of the guys a couple of times in the hand. Then we've got these dumb officers trying to figure out the law between the TWO of them and we had the owner of the bike on the phone. He asked us to pay for the bike for him, he then transferred us the money. He'd paid a lot for it originally so was just happy to get it back. Sounds like a pretty horrible situation... why didn't the police arrest him for assault, never mind the bike?! So the story and the cops get even more stupid at this point. So, the guy tore his shorts in the tussle, he told the cops we tore his shorts, and then when the guy who was hit with chain told the police he wanted to press charges for assault the officer told him 'but you tore his shorts'. Like it evens out somehow. But they refused to press charges. Lodge a complaint against the cops and spend £35 to cue up a small claims bid to return that £300. I think you would have a good chance, this stinks. Essentially the cops made someone pay to have their property returned, not a good look. This is serious Evening Standard frontpage material. You should lodge all the complaints and contact the rags. Make a compliant. This is madness. We made a complaint and the owner also made a complaint and I believe he's going down the small claims avenue. We had a visit that evening from an investigating officer who apologised and admitted everything they did was completely wrong. Apparently the two officers were new, fresh out of Police Academy and will be retrained, which sounds pointless if they can't grasp basic law. Anyway, just wanted to share this ridiculous story, thankfully nobody was seriously hurt and someone has beloved bike back....no thanks to the police. Is the investigating officer going to investigate the initial complaint or are they related to the complaint? New to role is no excuse for poor work. My friend's bike was stolen last night from outside a pub near Dalston. It was weird because they left his kryptonite, still locked, on the lamp post. Bad pic but you get the idea. Let me know if you spot it anywhere. He loved cycling so I want to help him get this replaced ASAP. Please let me know if you have anything for sale similar to the bike in the pic, steel, 52-54cm, geared, flat bar. Beloved Giant Bowery stolen in Hatfield on Mon night (8 April). 2008 model, black & silver, Cannondale saddle with an orange stripe. Had two masked moped dickheads pull up outside my work, angle-grind a fahgeddaboudit mini off my bike through a fence in broad daylight and drive off without anyone batting an eyelid. That’s two beautiful ti bikes in the space of 8 months - screw this city. 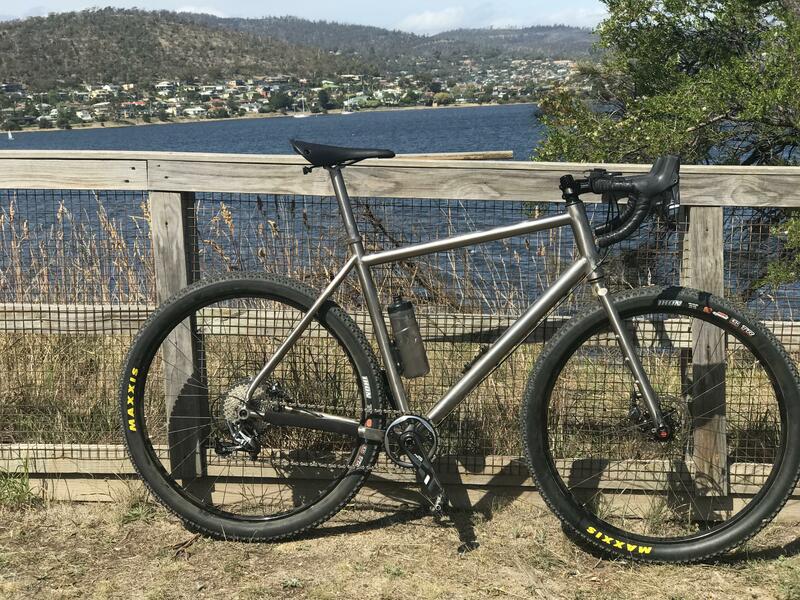 Yup, it’s rocked me on tour around Tasmania and ripped over the Gravel dash... sadly not going to get any more nice bikes for London. Still, insurance, which is good - but I’ve only just got through with claiming for the last one though so I’m sure they’ll have some extra questions this time. is this a custom frame? looks super nice, love the fork too. Designed by a guy off the forum and made by the decent Chinese custom titanium place. It’s 100% one of a kind. After the last one got nicked the building offered to fit cctv but they messed around with implementing it and now it’s 2 for 2 to the bike thieves. Tbh though, these guys were pro’s - angle grinder, masks and a no doubt stolen scooter - cctv would be nothing but a pixelated reminder of how it happened. My design. Made by Waltly. nah, figured that death trap forks will be enough on that one. Glad you’re still about - can I grab a statement that you sold me the frame for x million pounds. For insurance purposes obvs. They were made with bike packing in mind, not shredding single track! How do I go about making such a statement? I know, I know - it wasn’t my intention... sometimes you just have to give these things a go. You know what I mean - I’ve just seen a pic of your knee from the Bullheart ride thread. If it’s alright I’ll give you a shout after I prime the insurance guys with the list of every part, it’s cost and equivalent purchase value that they’ll no doubt insist on. Then if you could just send an email saying I sold this, for that much on this date, it cost this much new - I’ll forward it on to them.